While other groups might find their local reality to differ substantially, we (the EA Geneva team) hope to convey some useful general insights by sharing what our community building efforts look like nowadays, and why. An increasingly diverse association with full-time staff since July 2017. This post documents our current model of building a local EA community. Our funnel captures the essential activities that have shown promise in fostering people’s journey into EA. We have not reached our current ideal design, though, and will likely make changes to it in the future. Health: build a locally anchored community that is exemplary of the guiding principles of EA (mainly through personal interaction, self-development & collective thought development). As highlighted through the craft is not the community, actually causing externally verifiable impact often feels like it interferes with serving the internal needs of the group, especially when starting out. Developing explicit models of our key audiences and their paths through the funnel has helped us to work out a somewhat balanced two-pronged, goal-driven approach. Length of stay in Geneva. Engagement: consolidating their paths to contribution. They theoretically appear to be sequenced but we found they are tightly interrelated in practice. Most of our activities nowadays serve more than one stage, as you will see below. Global integration: tying everything into the global community. Local coordination is the subject of post 4 in this series. Global integration deserves an entirely separate discussion. Core: individuals having completed our advanced workshop. 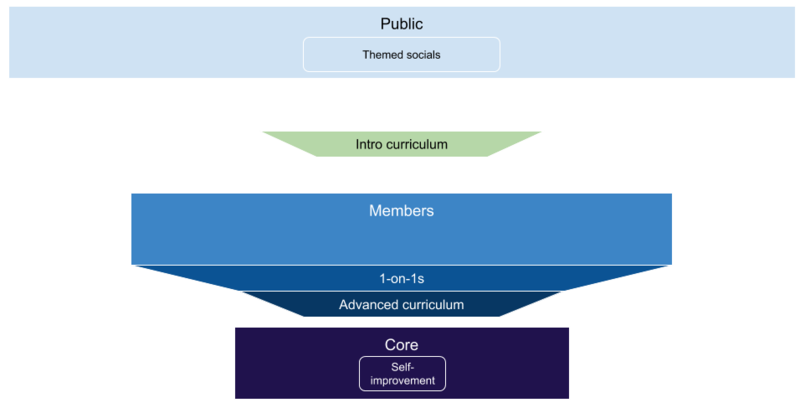 One can join the member segment without a workshop if two core members, after a 1-on-1 each, judge that one has demonstrated full knowledge of the subjects of the intro curriculum. We do not currently plan to make such exceptions for the advanced workshop. Increasing access to resources, activities and infrastructure. We expect this way of escalating asks and rewards to result in more meaningful activities for all segments and to motivate people to move further down the funnel. The key drivers from segment to segment are the workshops. Thinking back to the beginnings of EA Geneva, we expect that we would have learned a lot faster if we had exclusively focused on building up the core activities that we, today, perceive as the backbone of the funnel. given us a set of activities allowing to integrate new contributors more effectively. From the start, 1-on-1s seem among the most effective ways to identify potential core members, address doubts, establish common knowledge, and develop someone’s mode of contribution. 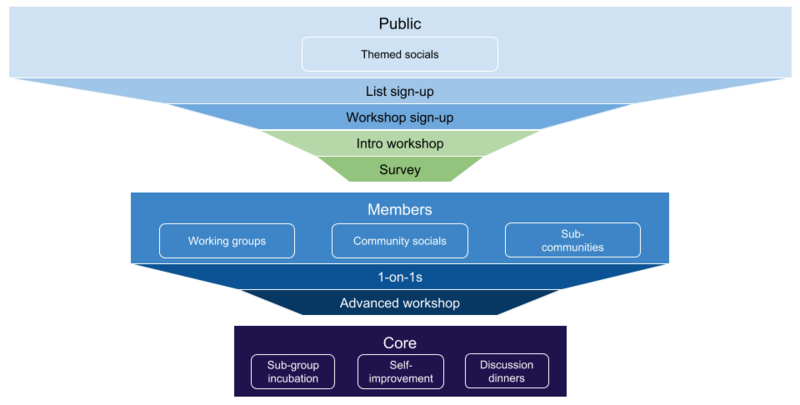 To build the knowledge, experience and skills necessary to run public workshops, we think it can be useful to start off by using the themed socials to study the subjects of the curricula of the intro workshop and advanced workshop (linked in the descriptions below). Depending on what the core group feels comfortable with, these exploratory sessions could be public, invite-only or somewhere in-between. For very small groups, the curricula could also be content of 1-on-1s. Making sure people are sufficiently proactive and open-minded such that a session is productive (people commit to 30 min of reading when signing up). Presenting the group, its goals, its activities, and its principles explicitly at the beginning of each public event also helps people to identify with the group - or not; motivates new contributors; and solidifies the group identity. To complement these key efforts, explicitly making the time for regular self-improvement group meetings to work on the core members’ personal development helps to set the tone for the broader community culture. Proactively sharing and discussing feedback on room for personal improvements, group dynamics and organisational optimisation has proven invaluable to us as individuals, as a team, and for the community. For us, these sessions will stay invite-only to preserve the necessary intimacy needed to work on personal bottlenecks together. Group-dependent activities: adaptations based on e.g. specialities, needs, interests, and local strategy. Work on applied rationality skills or other self-development. A clearly defined objective in line with the possible purposes. Make sure core group members also spend 1-on-1 time with one another. Mingling with newcomers to present the community welcomingly. Making space for members to contribute by sharing their knowledge. Wide range of topics and formats possible (moderated discussion / practicing or studying / talk with Q&A / etc.). Social time to chat, exchange and foster the community ties. Once established, this is a very low-cost activity - we run this format biweekly. Get to know interested people to explore their potential. Career planning, donating, and promoting the ideas. 8h-workshop with collective lunch (we have developed a slight preference for this due to the group dynamics resulting from its intensity). Not posing as an expert group but as individuals who are still learning about it ourselves. The setting is ideal to get to know new additions to the community - make sure you register people’s interests, needs and potential somewhere to motivate and integrate them optimally. 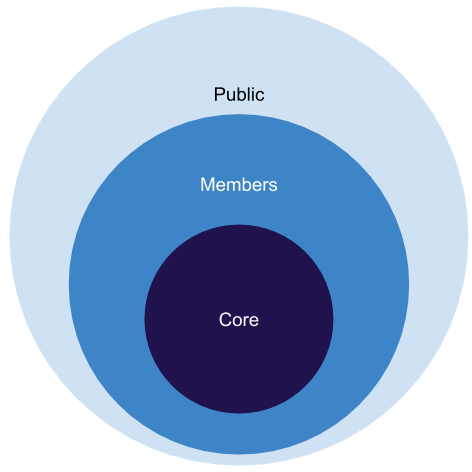 Get members to a level where they can contribute to the local and global community’s intellectual development and quality. Very discussion- and exploration-heavy - fewer presenting than in the intro WS, more guided by questions. Create reports and project proposals based on in-depth explorations of a chosen topics to foster understanding and goal-orientation of the local community. Groups are mainly self-organised but group leaders send weekly updates and attend monthly governance meetings. Depending on the activity, sometimes only a limited amount of people can attend - some activities should even be invite-only - like discussion dinners. Organise content-free activities only around once a quarter;- a plain BBQ is only interesting if everybody knows each other sufficiently well. Do not expect members to switch sides after your talk - the goal here should be to win allies for cross promotion. Do not expect to initiate collaborations - this has turned out to be hard. A good outcome is 1-2 new active members per event. We see sub-communities as a subset of the fractal that is our local group, which is a subset of the fractal that is the global community. We are still unsure about the best conditions to start these but think that any community above some critical mass of active core members will likely benefit from regrouping. If demographic, the group will likely benefit from staying exclusive. Has to fit into the broader local community building strategy. Potential downside risks need to be made explicit. A slightly special sub-community that we think deserves more attention, is a self-improvement community. This means, expanding the exclusive self-improvement group(s) to the entire community. From where we are standing, it looks like the only way the EA community will have long-lasting impact, or will itself last the test of time, is if people find a tribe within it. Self-care, cultivating compassion and applied rationality, we hope, might help to build a basis that does not just create further in-group vs. out-group dynamics. Co-written by Nora Ammann and Konrad Seifert.